SMDM helps you to be more than just a face in the crowd. SMDM members contribute critically to health policy research in the areas of evidence-based medicine, cost effective health care, patient decision making and public health. If you are involved in health care decision making, working in a hospital, university, foundation, industry or government, at any stage of your career, SMDM can provide you with a scholarly home and opportunities for collaboration, professional growth, networking and mentorship. Don't forget to update your information here! *All memberships run from January - December. New members who join with their Annual Meeting registration in the autumn will have their membership honored for the following year. **Multi-year memberships are available and encouraged. 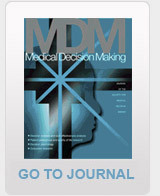 All memberships come with a complimentary subscription to Medical Decision Making journal. Please specify on your paper or online application whether you prefer a print + online OR online only subscription.